What Are the Yankees’ Options at DH? How Much Would It Cost You to Go to the NFC Championship Game? All right, so it's pretty amazing that the Giants are in the NFC Championship Game. Here's a fun factoid: The Giants are 4-0 lifetime in NFC Championship Games. They've never lost! That's pretty good. So, as a diehard Giants fan, you wouldn't dare miss the opportunity to see this in person, would you? Of course you wouldn't. 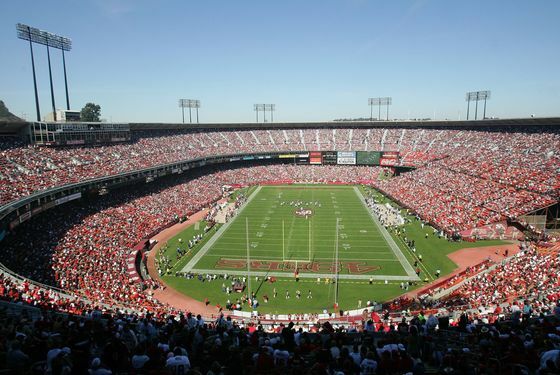 So let us play travel agent for you: Let's see how much it'll cost to get you to Candlestick Park on Sunday. Now, San Francisco is one of our country's loveliest cities, so ordinarily you're going to want to spend some time there, rather than just zipping back and forth for a football game. (Though for all San Fran's beauty, honestly, it's shocking how much cleaner Manhattan is these days, isn't it?) But this is no ordinary circumstance: This is a last-minute, crazy cross-country jaunt to watch the Giants head to their fifth Super Bowl. More to the point: Because the game is on the West Coast, because kick off is so late in the day (6:30 ET, 3:30 local time), and because Candlestick Park is so close to the San Francisco Airport — pretty much the only thing worth visiting in that city that is close to the airport — you can actually get up Sunday morning, fly there in plenty of time for the game, and still catch a red-eye flight home that night. Sure, that's pretty intense, and you probably shouldn't expect a productive Monday. But c'mon, it's for the Super Bowl! So: How much would such a lunatic quest run you? Let's take a look. First off: Flight. If you want to fly nonstop — and with a 24-hour sprint like this, we'd certainly recommend that — Kayak brings up a Virgin America flight that leaves JFK at 7:30 a.m. ET and arrives at San Francisco International Airport at 11:10 a.m. PT, four hours before game time. Plenty of time! The flight leaves SFO at 9:25 p.m. PT, about two hours after the game will end, and deposits you back at JFK at 5:55 a.m. Monday. That's a long enough flight to sleep off the booze, or, if the Giants win, to consume more and scream Big Blue chants. Either way: It'll cost about $856. Steep, but hey, today's Tuesday, and the game's on Sunday. Now, how about tickets? The cheapest ticket currently on StubHub is $314 for Upper Reserve Corner 4, Row 23, which we're fairly certain isn't even in the stadium. (You might as well stay at the airport and find a way to the roof.) So let's go with Upper Box North Endzone 48, which is $425. (Field Box tickets are going for $4,000 a ticket. A bit steep.) When you add the $20 it'd cost you to get a cab from the airport to the stadium, and another $20 to get back there afterward, we're up to a total of $1,321. That's a lot, sure, but remember, that's without a hotel; it could be a lot worse. Of course, that total is just for one person. You might want to find a friend to come with you, if only to split the cab cost. But, come on: $1,321 for a lifetime of memories? You'd be a fool not to go!